Getting to Kyoto from Bangkok involved a very long day of traveling, which seems to be a recurring theme on this trip. First we took a 5-hour flight to Tokyo, then had to hop on an hour-long train to get to the 3-hour-long Shinkansen — where we had to stand in the unreserved smoking car for about 45 minutes before getting seats. We also had a bit of a failure in planning here — we had no baht left to exchange for yen, so we didn’t get any in Bangkok. Then we missed the exchange counter at the Tokyo airport, leaving us with 0 yen, and thus no food or drink possibilities. We thought we’d be able to find an ATM at one of the train stations, but that didn’t happen, and when we finally got to Yamashina, where we just needed to take a Kyoto subway 4 stops to Daigo, we got stuck. Our Japan Rail passes wouldn’t cover the trip, the ATMs we found wouldn’t take foreign cards and at 10:30 p.m., we didn’t have any exchange options we could see. We were also caught in a thunderstorm. Thankfully, we were able to call the person we were staying with, Ted, to come pick us up. He even had dinner ready for us when we got to his house. We spent our first few days in Kyoto exploring the city — going shopping, eating at vegetarian restaurants and checking out the temples. Kiyomizudera was my favorite, with its pretty trails, beautiful views and quaint wooden shrines. 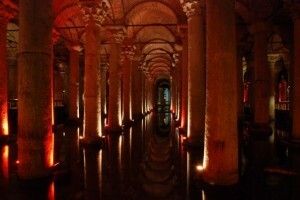 The complex also has a waterfall that people drink from to gain luck and knowledge — we made sure to drink up! We also spent some time in Gion, where we saw a Geisha in her full get-up, with white face makeup and all. Tons of people were snapping photos of her just crossing the road. There were many other women in traditional kimonos, but not many were fully made up. We visited some other temples in the hills that form the city’s border, like Nanzen-Ji, where we walked through an enormous gateway and under a red-brick aqueducts and up into the woods to visit a small shrine by a waterfall. And we walked down the Philosopher’s Path, a quiet walkway by a canal, until we found Honsen-In, another temple, which was closed for the day. We were able to scramble over to the Ginkaku-Ji, the Silver Pavilion, shortly before closing time, but were disappointed to find the structure undergoing a complete restoration — it was basically a shell of a building covered in tarps. 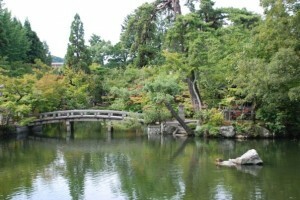 The gardens, however, were well worth the visit, with clear ponds, stone steps leading up to a view point, sunny and shady areas, plenty of moss groundcover, and a sand garden shaped to represent Mount Fuji and the sea. We took a second loop around the grounds because we liked it so much. 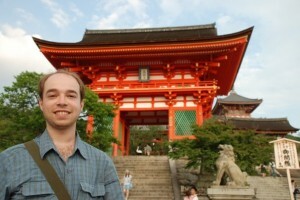 The rest of the time we were based in Kyoto, we took day trips to nearby cities. Also, we were surprised by how hot Kyoto, and Japan in general, was — the heat and humidity made Thailand feel temperate, and we had to buy little towels to wipe the sweat from our faces. Who knew? 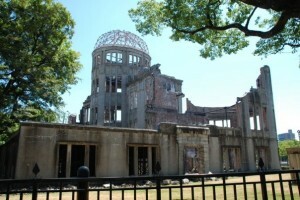 First, we took the Shinkansen to Hiroshima, where we visited the peace park. We saw the A-Bomb Dome, the ruins of a neoclassical building that was very close to the hypocenter of the blast, which was eerie — parts are still standing, other parts are totally mangled, and there are Japanese families taking photos giving the peace sign in front of it. From there, we walked on to the island where most of the park is, and saw all the paper cranes that comprise the children’s memorial, then went by the eternal flame and the cenotaph, which looks back on the A-Bomb Dome. We also visited the museum, which gave a detailed history of Hiroshima and a good amount of insight as to why it was bombed. It also had a lot of information on nuclear weapons and really showcased the devastation of the city through photos, models and artifacts from the day it was bombed, like warped metal girders, burned clothed, melted roof tiles and some gruesome victim portraits. The museum isn’t only a memorial of what happened there, though — it is truly a call for peace and an end to nuclear proliferation. It was very powerful to see such a tragedy turned into a positive mission. After taking in the museum, we also checked out the memorial hall, a large, echoing sunken space with a fountain at its center and the names of Hiroshima’s neighborhoods set around it. Also, we noticed that water played an important role at the peace park — many visitors were leaving water bottles at the memorials — and we learned that it’s because many of the bomb’s victims died begging for water. 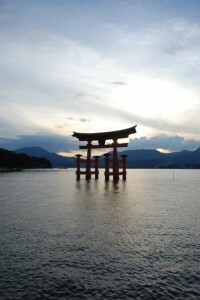 Once we’d toured the park, we were ready for some lighter fare and headed to Miyajima to see the tori gate in the sea. We took a ferry over to the island and were surprised to find lots of deer to greet us. We walked down the coast to the shrine, which was closed because it was a bit late in the day, then watched the sun set pink behind the bright orange floating gate. Our second day trip was to Himeji to see the castle. From the train station, we walked right up the main road until it stopped at the big, scenic moat. We walked across the bridge and onto the castle grounds and went to the main tower — a big, white, multistoried building on a tall stone foundation. There were lots of small spaces for people to throw rocks or boiling water down on invaders, and these came in square, circle, triangle and rectangle shapes. 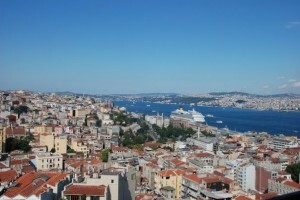 It was also a no-shoes building, so we climbed the stairs to the top barefoot, carrying our shoes in bags. I don’t know why they insist in putting metal caps on the ends of the stairs for people going barefoot — it’s quite an uncomfortable climb. The view from the top wasn’t all that great — Himeji looks pretty industrial — but it was nice to see the castle. When we returned to Kyoto station in the evening and took the escalators up to the roof garden on top top of the cool modern bulding to take in the nighttime view, then walked across its glass walkways. Our day trips started feeling like doing suicide sprints backwards — we started with the longest, Hiroshima, and just kept on the same train lines, going shorter and shorter distances each day. We definitely made the most out of our JR passes. The bullet train was basically our daily transport, which really helped us get back and forth quickly, though we wish we could have ridden the super-speedy Nozomi trains, which had better, longer routes. Osaka is only a short ride away from Tokyo, yet it feels quite different. 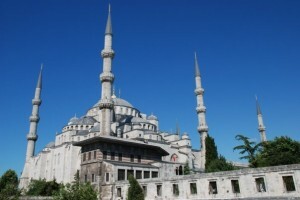 It’s much more modern, and much more crowded. We first went to the aquarium, since it was highly recommended. Apparently it was highly recommended to all of Japan, though, since there were some really incredible crowds. There were people blocking every tank and sign and women on bullhorns yelling announcements every few feet. It made for a pretty stressful visit, though we did manage to at least get a glimpse of the dolphins, otters, penguins, rays and whale sharks. The best part was a smallish exhibit with baby otters, which was set apart from the main path and nowhere near as packed. 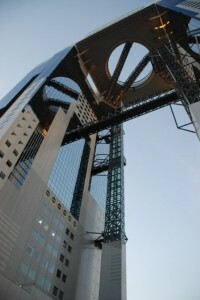 Next on our sightseeing tour was the Osaka Sky Building, a transformers-looking structure, with two tall buildings attached at the top, with long escalators running to the roof garden observation point and a thin bridge at the 22nd floor. We made it to the top just in time for sunset, when the clouds and sky turned a beautiful pink over the sprawling city. And riding up to the top in the glass elevator and then taking the glass escalator the last five stories was quite a thrill. Check out more photos in Evan’s Facebook gallery. Sorry again for the long delay between posts — it’s tough to get a good deal of time to blog while on the road. I did keep up my journal, though, so let’s take a look at the rest of my around-the-world adventure, starting with 3 days in Bangkok, Thailand. On the night of August 4, we took the sleeper train from Chiang Mai to Bangkok because we’d heard it would be a fun way to travel. In retrospect, we probably should have just spent the money on booking a flight. We rode in a second-class car, and I had an upper bunk while Evan had a lower one. The food was inedible, and there were no veggie options, though we had the good sense to bring some snacks. The car seemed to be infested with what looked like baby cockroaches — I squished quite a few, and saw many more scurrying about under our seats and on the walls. And sleeping on a train is no real substitute for sleeping in a bed, especially when there’s some anxiety about vermin, so we arrived in Bangkok exhausted. We caught a cab to our hotel — the New Siam III in Banglamphu, the backpacker area, but the room wasn’t ready. To keep from falling asleep, we went for breakfast at a nearby cafe, then went downtown to buy our Japan Rail tickets. We spent the rest of the day wandering around the downtown malls, and went to visit the Ocean World Aquarium, which is conveniently located in the basement of a mall. The underground aquarium was surprisingly expansive, and we even got to ride a glass-bottomed boat around the top of the biggest tank. We also saw the sharks and sting rays at feeding time from the tunnel that goes through their tank. 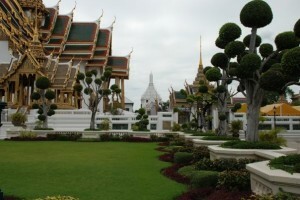 The rest of our time in Bangkok, we visited more classic sites, like the Grand Palace, Wat Pho and Wat Arun. The palace was as extravagantly and elaborately decorated as I ever could have dreamed, though a good deal of it was off limits, and at Wat Pho, we put coins in the long row of bowls along the giant, temple-sized reclining Buddha for good luck and a long life. 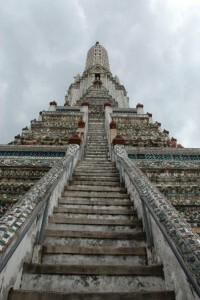 We climbed up the pottery-encrusted Wat Arun, also known as the Temple of the Dawn, which is the oldest temple in the city. And we spent a lot of our time traveling between sites on the express river boats, which aren’t too fast, but have good views, though the river is a scarily murky brown color, and they don’t get stuck in traffic. Still, we did take a cab across town once, and we ended up paying only a little more than we would have had we taken the sky train-express boat combo that we would have needed to get back — and got a comfy, clean, air-con ride for about $3. 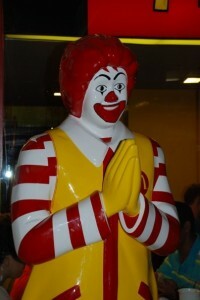 Check out more Bangkok photos in Evan’s Facebook album. We’ve got our gear, now where do we jump? 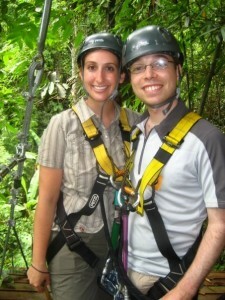 Today Evan and I went on the Flight of the Gibbon treetop zip-line adventure. We got picked up at 8:30 a.m. and driven out of Chiang Mai, up a windy mountain road. We got outfitted with harnesses, helmets and “brakes” — V-shaped pieces of bamboo. Then our group of 8 was driven to our starting point — a platform by a tree on one side of a gorge. After some brief instruction, which included pretty little — basically, you just hold on to the rope, keep your feet up and brake when told — we were clipped in, then sent off, one by one, hanging from a steel cable, to a platform on a tree maybe 10-seconds’ journey on the line away. When we got there, we were clipped to a safety line while we waited for the rest of the group to cross, swaying the tree each time they hopped off the platform and put their weight on the line. 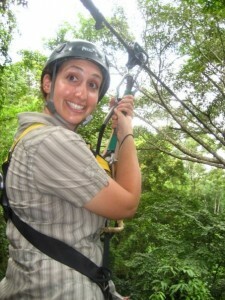 The day continued with us leaping between the trees, past streams and by plenty of lush greenery. There were also a few rope bridges to cross as well as 3 points where our instructors belayed us down to lower platforms — sometimes as frighteningly fast speeds for parts of the journey. We were constantly reminded, “Legs Up!” to keep them from smashing into the landing platforms, and of course to “Braaaake!” Some group members did better than others with taking directions, but everyone ultimately got across safely, including a little kid who one the longest line got stuck halfway across because she wasn’t heavy enough to make the journey. The instructor went out and met her, the pulled her to meet the rest of us. One of our guides, Jabu, liked to cross the gaps upside down, which was quite a sight. I don’t think we could have done that in the harnesses we had, though. When we were done with the tree course, which lasted about 2 hours, we had some lunch up by the main office. Then we were driven to a pretty waterfall that we hiked up (well, climbed the stairs to) as a group but sans guide. Sadly, that was the last stop on our mountain adventure. We drove back to town, had some food, and shopped at the outdoor market by Tha Pae Gate. Then I got all caught up on my blogging (whew!). Check out all of our high-flying photos (they’re quite funny) in Evan’s Facebook album. 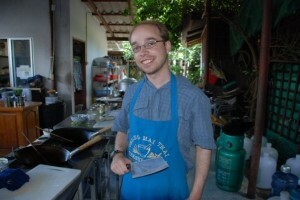 One thing Evan and I have wanted to do for a long time is take a cooking class, and we heard that Chiang Mai was the place to do it. We signed up for a day-long course at the Chiang Mai Thai Cookery School, and were picked up in the morning and taken to The Wok restaurant, where we were going to learn about Thai ingredients and how to put them together. We started by taking a trip to the market, though most of the class actually stayed in the cooking demonstration room to hear about what we got to see in the market. When we got back, we started on the first of our 6 dishes of the day. Unfortunately, we wolfed almost all of the food down so fast that we didn’t didn’t get any good photos of it. Oops. Or should I say, burp? Our first dish was tom yam soup, which is a sweet/sour/spicy prawn soup. Since I don’t eat fish and Evan doesn’t like prawns, though, we made tofu and chicken versions, which turned out splendidly. We just added some ginger, lemongrass, mushrooms, tomatoes, shallots, chili peppers, cilantro and lime to our broth, and we had a delicious and quick soup. Definitely one to try at home — and we got a recipe book so we could recreate the dishes we learned to make. The next dish was fish cakes. Evan made the fish version while I made a tofu version that came out really well. All I did was mash up tofu with some soy sauce, egg, tapioca flour, green beans, kaffir lime leaves and palm sugar than toss it into oil in a wok. The instructor made some sweet and sour cucumber sauce to go along with them, too. Next, we made green curry, which was our most complicated dish because we had to separate the oil out of the the coconut cream in our wok, which wasn’t exactly an obvious process. Thank goodness our instructors told us when to leave it, turn up or turn down the heat. As with most of our dishes, our instructor encouraged us to use lots of chilies, so it turned out super spicy. It was still really delicious, though, and we also had a chance to let it cool off while we cooked some pad thai. I’ve done pad thai before at home, and as expected, it was a bit of a scramble to get everything cooked the right amount. Still, it was relatively easy, and for the veggie version, instead of fish sauce I used soy sauce, and instead of oyster sauce I used mushroom sauce. The pad thai and curry lunch with rice was delicious and filling, and it was interesting to compare how the dishes could turn out a bit differently even with the same ingredients and the same instructions. After lunch, we finished up by making a chicken salad — I made mine with mushrooms — which was my least favorite dish of the day, though still quite tasty. And we made a dessert of boiled, dyed-red water chestnuts, which we coated in tempura flour before boiling. They turned out translucent and ruby-like, and we at them in coconut cream and sugar syrup with ice to keep it cool. I didn’t expect to like it as much as I did — it was a great, refreshing end to a thoroughly delectable yet stuffing day. Who wants to come over to dinner when we get back to LA? 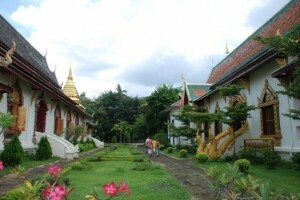 We left Ko Samui on July 31 from its adorable, superbly landscaped, hut-based airport. It’s really very charming. We flew through Bangkok to Chiang Mai, where we rode in the back of a pickup truck, also known as a songthaew here, to our hotel — Your House Guest House — where we got a nice, big room with a big bathroom, air conditioning and a balcony for about $21. The only drawback is that we’re right next to 2 bars, which play competing loud music until 1 or 2 a.m.
Our first order of business was getting lunch, and we went over to Aum vegetarian restaurant and used book shop for our best meal in Thailand so far — eggplant, mushroom and tofu stir fry, and khao Soi, a peanutty noodle dish that’s a northern Thai specialty. Yum! Then, we wandered to the river, where we were hoping to catch a boat. The boat was broken, though, so we turned back and explored some of the temples that were on our way. 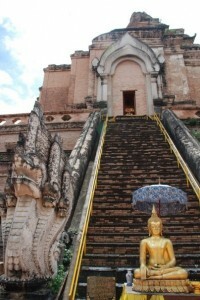 They all had elaborate dragon banisters, lots of gold Buddhas and plenty of colorful and shiny decor. We continued our temple tour the next day, with some of the larger temples in the city center — an area surrounded by a square moat and some old and crumbling defensive walls. Once again, there were lots of big Buddhas, dragon ornaments and red and and gold decor. We even got to see some young monks chanting in the main temple, then go on a procession around the buildings carrying flowers. 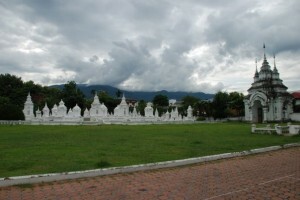 We also visited a temple out of the city center that had a royal graveyard (or at least tombs for royal relics), which consisted of a lawn full of white structures that looked like a play palace complex. Since it looked like it’d start raining (and it did soon after), we headed to the mall to go see The Dark Night, which we’d been meaning to see for a while. The tickets? 180 Baht for the 2 of us (about $5). Thankfully, there was no intermission, though we did have to stand for the national anthem before the movie started. It was still pouring when we got out of the movies, so we hired a tuk tuk, a three-wheeled motor cab, to take us to the night bazaar. We shopped, ate and marveled at the expansiveness of the nighttime-only stores that sell everything from toys to clothes to dried fruits and more. While walking home, though we got the surprise of the day — we saw a baby elephant and some people (its owner?) just hanging around outside of a convenience store. We didn’t go over to gawk or ask to touch it. 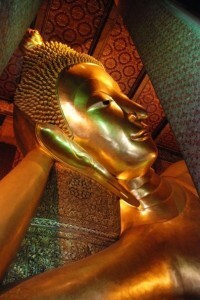 See more Thailand photos in Evan’s Facebook album. 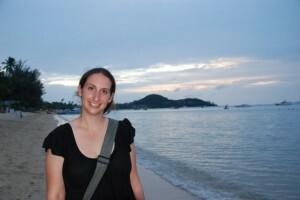 Our first stop in Thailand was an island in the gulf called Ko Samui. We stayed at the Smile House for the first two days on Bophut Beach at the north end of the island, which was a nice place, set back a bit from the beach, then we moved a bit farther out in Bophut to the Cactus Bungalows where we had a bungalow just steps from the sand. We spent the July 25 to 29 sitting on the beach, reading, napping and not going very far from our hotel. 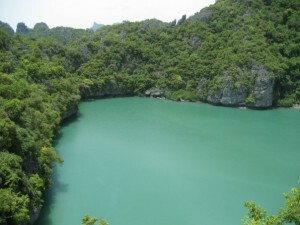 It was only on our last day on the island that we actually got out to do something — we went to Ang Thong Marine Park. We took the Action Islanders Adventure speed boat tour, and somehow got on the slow boat. Well, the boat itself went quickly, but we had to make a stop at a neighboring island before heading off to the marine park, which was quite a bit detour. The ride between the islands was quite choppy and Evan was NOT happy — he’s not exactly a huge fan of boats or water. About 5 minutes into the ride, he turned to me and said, “I regret coming out here.” He decided to stick it out, though, even though our driver said that the trip to the marine park would be as bumpy if not more so than our first leg, and he took some Dramamine, which helped a bit. When we got to our first stop — a cove to go snorkeling in — we relaxed on the boat for a while before going in. When we decided to put on our masks and head in, we both ended up having a good time. I was a bit scared at first, since I don’t like fish very much, but I steered clear of the biggest schools and the areas where people were throwing bread in the water, and some quite a few types of fish as well as lots of coral. Our next stop was an island with a saltwater lagoon in its middle — the island that inspired The Beach. We hiked up to a viewpoint, then hiked down to the lagoon, though you can’t go in. The hike was short, but it was on some super steep and treacherous staircases. We then boated a short ways over to a picnic area for lunch where there were wooden swings between the beachside palms and beautiful views of other islands. 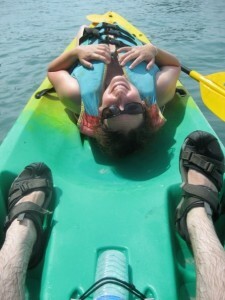 Kayaking — does the pose look familiar? The best stop, though, was our last — kayaking. Evan and I shared a kayak, and our guide took us around a small island, going into some seaside caves on the way. It was beautiful and peaceful, except for when the guide started splashing everyone. We also stopped at a very small and quiet white sand beach to do a bit of swimming — definitely an island paradise. Thankfully, the trip back couldn’t have been more different from the trip out — it was essentially flat, totally smooth cruising to Ko Phra Ngan. Evan said it it were always like that, boating could possibly be considered pleasant. The shorter inter-island trip was a bit bumpy, but it was pretty quick, and a one-eyed van driver took us back to our hotel. Thank goodness the sea got calmer and our activities were fun because aside from the trip over Evan did end up having fun. Exhausted when we got back, we had a little snack, then while Evan napped, I read and napped on the beach, then had a Thai massage in a hut on the beach. It felt like I’d imagine a visit to a chiropractor would — lots of stretching and pressure — and I felt very relaxed when it was done. 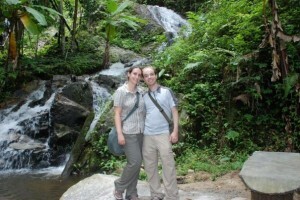 See our photos from Ko Samui and our first days in Chiang Mai in Evan’s Facebook album.